Youngstown State forward Mary Dunn has been named the Horizon League Freshman of the Week for the period ending Feb. 19, the conference office announced on Monday. This is the fourth time that Dunn has been named the league's Freshman of the Week, which is the most in the conference. YSU is also the only school in the Horizon League to have two different players named the conference Freshman of the Week as Morgan Brunner earned the honor once. Dunn averaged 12 points and shot better than 54 percent in each of YSU's games last week. She scored 18 points and grabbed a career-high eight rebounds in the Penguins' overtime win over Northern Kentucky on Thursday. She then scored six points on Saturday versus Wright State. Dunn combined to go 9-for-16 from the field for the week, and she made 6-of-7 from the free-throw line. In addition to being named the Horizon League Freshman of the Week a league-leading four times, Dunn has done plenty more to be a top candidate for the conference's Freshman-of-the-Year Award. 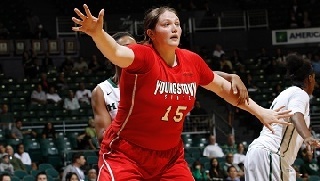 She leads all Horizon League freshmen in points per game (11.3), field-goal percentage (.515) and blocks (18). She is the only freshman to rank among the league's top 30 scorers this season. Youngstown State will conclude the regular season this week with two home games at Beeghly Center. The Penguins will host Oakland on Thursday at 7 p.m., and they'll host Detroit Mercy on Saturday at noon.